Made in Abyss: Journey's Dawn compresses the first eight episodes of the series into a two-hour film. 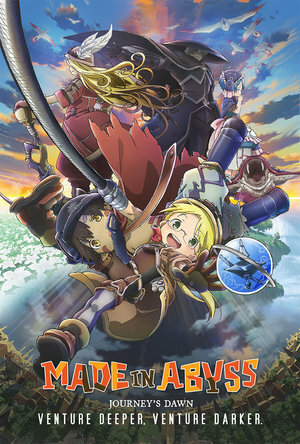 The anime Made in Abyss: Journey's Dawn makes its North American theatrical debut as a Fathom Event on 20 March (subtitled) and 25 March (dubbed). The original television series consisted of 13 episodes and followed 12-year old Riko and her humanoid robot friend Reg as they descended into the titular abyss. Made in Abyss: Journey's Dawn compresses the first eight episodes of the series into a two-hour film. For viewers who have already watched the series, there isn't much fresh to look forward to in Journey's Dawn. The most notable addition is a new prologue, which collapses much of the exposition about the setting scattered throughout the show into a brisk five minutes. Here we see a series of painterly stills of how the island where the Abyss is located was first discovered, early settlements around the edges of the pit, and finally the growth of the town of Orth to support the Abyss' ongoing exploration. This streamlines much of the show's backstory and allows for a lot of condensing of the early, Orth-based part of the series. Beyond that, Journey's Dawn is familiar ground. The film is just a recap, using the same voice acting and animation as the television show. Unless the appeal of seeing anime on the big screen is enough to get you out to the movies on a weeknight, series watchers can skip it. However, if you are new to Made in Abyss, then Journey's Dawn is a treat. Riko is a 12-year-old living in an Orth orphanage that doubles as a training ground for new explorers of the Abyss. She and her friends spend their days in classes learning about the history of the Abyss while also exploring the relatively safe upper reaches of the chasm. They search for relics of a lost civilization that once inhabited the Abyss; even the most common of relics can later be sold in the outside world to support the orphanage and the town itself. But Riko isn't technically an orphan. Her mother was a famous explorer who left when Riko was two years old on a daring deep dive into the Abyss and never returned. For years Riko has quietly harbored ambitions of going into the pit and finding her mother, and the arrival of Reg gives her the excuse she needs to finally do it. Reg is an amnesiac android with a mostly human appearance, save for a pair of metal forearms that can shoot out for hundreds of meters on cables and retract. He's friendly and loyal and acts completely human and he immediately bonds with Riko. He also comes equipped with an incinerating hand cannon that fires a huge burst of energy. The forearms are extremely useful for easily getting down through the thousands of meters of the Abyss, while the incinerator is pretty handy for fighting monsters. The series took several episodes for Riko and Reg to get moving, and the bulk of the editing of the film comes in this early section. Journey's Dawn gets to the good stuff quickly and then spends the bulk of its running time as the pair begin their descent into the Abyss. Still, at two full hours, the film is long. The climax happens around the 95-100 minute mark with an intense fight sequence and a series of revelations for Riko. But then it drags along for its final 20 minutes as the creators just can't bring themselves to cut down very much material from what was the slow, quiet eighth episode. Stylistically the film resembles a Studio Ghibli project. Ghibli founders Hayao Miyazaki and the late Isao Takahata aren't involved, of course, but longtime Ghibli mainstay Osamu Masamaya is the project's art director. This comes through in the lush environments, ramshackle town design, and creature designs that are equally appealing and threatening. The Ghibli influence is also notable as the story starts as a kind of fanciful adventure, similar to Miyazaki's 1986 film, Castle in the Sky, but gradually ratchets up in intensity to the point where the borderline horror elements recall Miyazaki's Princess Mononoke (1977). Finally, Australian composer Kevin Penkin's heavily piano-based score often resembles the music of Miyazaki's collaborator Joe Hisaishi. Made in Abyss is an interesting story with a cool concept. The idea of a pit so huge and deep it's never been fully explored is a strong one. Especially because it's paired with a great drawback; Abyss explorers feature more and more debilitating side effects as they try to ascend from deeper down. At one point Riko is captured by a giant bird and brought up to its nest. When we see her again, there are obvious traces of vomit on her clothes. And that's just from being lifted up a few meters from a relatively shallow point in the Abyss. This list of conditions plus Riko's mom's reputation as a legendary explorer gives the viewer hope that Riko's quest may not be as futile as it appears. Journey's Dawn is a nice change of pace from both the usual fighting-based anime that make the rounds in North American theaters as Fathom Events and a break from the ever-rotating stable of Ghibli films that play on scattered weekends throughout the year. It's an adventure story with an emphasis on exploration and it has a hidden emotional core that makes it resonate strongly. In Japan, Journey's Dawn was quickly followed by Wandering Twilight (releasing in the US this year) which gives the same treatment to the remaining five episodes. Fathom Events is supposed to show that second film later in 2019, but fans who have seen the whole series will likely still be waiting for when the show's second season is eventually released.